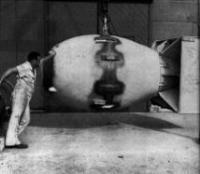 These photographs were released in the late 1950's and are said to show the first atomic bomb that was said to have been tested on July 16, 1945. 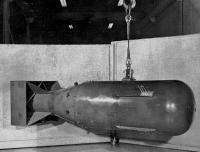 The photograph above was first released in 1957 and according to the press release, shows the bomb that destroyed Hiroshima. 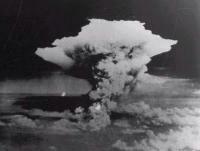 This photograph, released in 1957, is said to show the bomb which destroyed Nagasaki on August 9, 1945. About 70 miles away, the cloud is still visible from the B29 aircraft. 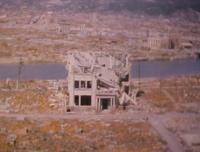 As most Japanese cities, Hiroshima was constructed primarily of wood. After the Bomb went off, almost all of the wooden structures burnt down over the next 3 days, causing essentially a desert. 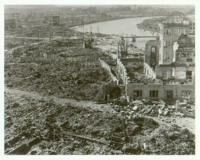 Shown are some of the fire gutted cement and stone buildings about 700 meters from the center. This tragic photo was taken just a few hours after the blast. 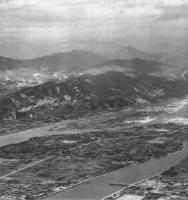 By this point, the primarily wooden city had started to burn extensively and by the end of the day, a firestorm developed, similar to what had happened in Tokyo after the famous bombing raid of March 9, 1945, when, according to the Japanese statistical office, 82,000 people perished. The firestorm was so intense that in some cases, the glass melted and the street asphalt melted. A sad photograph of people looking on a bulletin board for any information on missing loved ones. 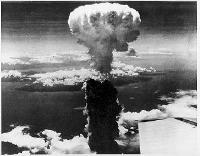 This same tragic scene was repeated, over and over again throughout Japan and also in heavily bombed cities in Europe. The famous trade hall, designed by a Czech architect, in the mid 1920's, is now called and known world wide, as the peace dome. This structure was about 100 meters from the hypocenter. 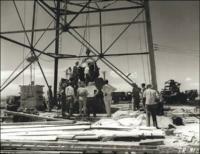 The epicenter was in fact 500 meters (1500 feet) high. It was one of a number of cement and stone buildings that stood up to the blast. 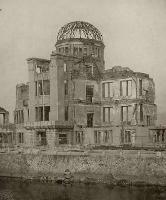 By October 1945, a thriving black market emerged in Hiroshima. In this case, near the main train station. There are 3 pages covering this topic. Press the keys below to see the other pages. 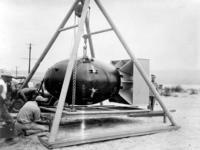 Very unusual technical issues and misconceptions, rarely published, about the Bomb.